Quickly becoming one of the most sought-after skills, 3D knowledge is a must for designers. Creative director at CBA Italy Giacomo Cesana recently said ‘3D modelling is the new frontier of graphic design’. Where 3D was once used mostly for pre-visualisation purposes, it’s now a growing design trend, with the creative industry paying much more attention to this exciting medium. 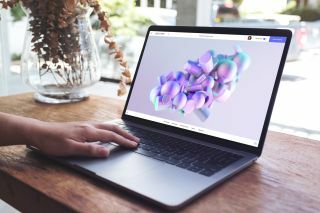 Innovative brands including Apple, Nike, Squarespace and WIX have all realised the power of 3D, using it to create striking, vibrant geometric compositions in their most recent advertising campaigns. And with 3D’s capabilities also becoming fully realised with augmented and virtual reality, it’s rapidly becoming the skill to have on your creative resume. While the leap into the extra dimension might seem a little daunting for those currently working solely in 2D, the introduction of various graphic designer-friendly 3D tools and training in recent years has made mastering the art of 3D much easier than you might think. Investing a bit of time in mastering this new skill could be a seriously lucrative move, and there’s no better time to start. Are you already designing in 3D? If not, here’s a list of reasons why you probably should be. If you’re wondering whether the move into 3D is really something you have time for or worth it, trust us when we say the answer is unequivocally, yes. Aside from the obvious benefits of developing your creative skillset, 3D is the foundational skill for motion design, augmented and virtual reality, 3D printing, visual effects and more, meaning you’ll be able to tap into a whole new client base. With forward thinking brands already exploring 3D space, this added skill set will also make you far more marketable than creatives working solely in 2D. Mastering a new skill takes time and patience, especially one as vast and complex as 3D. But the introduction of new 3D tools in recent years has meant it’s no longer such a daunting prospect. Whether it’s awesome geometric 3D art, elements for your website, 3D typography or abstract 3D designs that you want to create, new graphic designer-friendly 3D software makes all of this possible in minutes. If you use a tool like Vectary, which provides editable templates, drag and drop options for objects, textures and lights, it means you can create your very own 3D scene instantly. Vectary also provides the option to share a 3D scene with other artists in the design process and collaborate/comment in the same space. 2D images will always be crucial to the creative process, however it’s not always easy to envision the final shape of a 3D object with a 2D image, especially when you’re dealing with complex geometry. By creating a very basic 3D model, unexpected or unwanted results can very quickly be spotted and dealt with at the early concept stage, allowing a lot greater control and accuracy over your designs. Despite what others might think, working in the design industry isn’t all always exciting. In fact, for those who do it every day, it can be very easy to get stuck in a creative rut. A great way to combat this is by introducing new easy-to-use 3D tools and creative workflows to your daily schedule. Why not combine 2D and 3D techniques to help shake things up a little, or add some 3D renders to a 2D sketch to give it an element of realism? You could even use a 3D model to inform the dimensions, perspectives and shading on a 2D illustration. If nothing else, there’s a lot of fun to be had in 3D space. Even if you don’t ever plan on using the designs you create, it will certainly help creative sparks fly. For more inspiration on what you can make, head over to Vectary’s blog or Instagram.